News about how our researchers are exploring social networks in communities; the new liveability report; and our virtual community of systems practitioners. Chief investigators and researchers discuss four years of collective nutrition research projects at the Prevention Centre; science communications training with a difference; and the liveability study expands. News about our new project on the compelling case for preventing chronic disease and key findings from the liveability project. 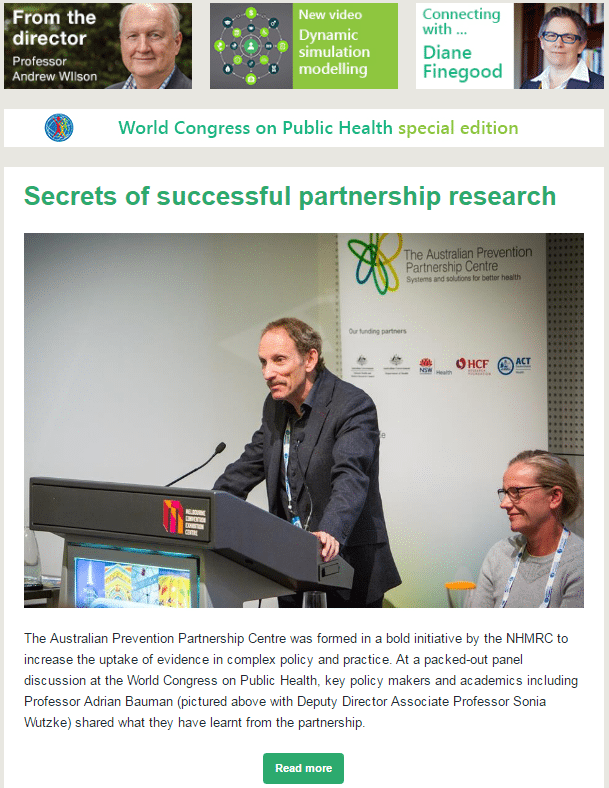 This special issue focuses on the World Congress on Public Health in early April, including the Prevention Centre's World Leadership Dialogue and panel discussion on partnership research. Our first edition for 2017 features a new format and a look at the use of big data in health, previewing a visit from health data expert Professor Nate Osgood. As we near the end of another year, we take a look at what we’ve achieved – and what we’re hoping for in the New Year. News about our project exploring the implementation of childhood obesity programs and new project on food security in Aboriginal communities. Researchers, policy makers and service providers have participated in the first of three workshops to inform the NSW Premier’s Priority for reducing childhood overweight and obesity.